For College Students With Kids, Getting Cheap Child Care Is A Challenge : NPR Ed Here's how difficult it is for students with children to get access to federal money for child care. Ever heard that term? It's used for a student who is also a parent, and there are nearly 5 million of them in colleges around the country. That's over a quarter of the undergraduate population, and that number has gone up by around a million since 2011. It can be really, really expensive to be a student parent, especially if you need to pay for child care while you're in class. In some states, child care for an infant can cost as much as $17,062 a year, according to a report by Child Care Aware of America. 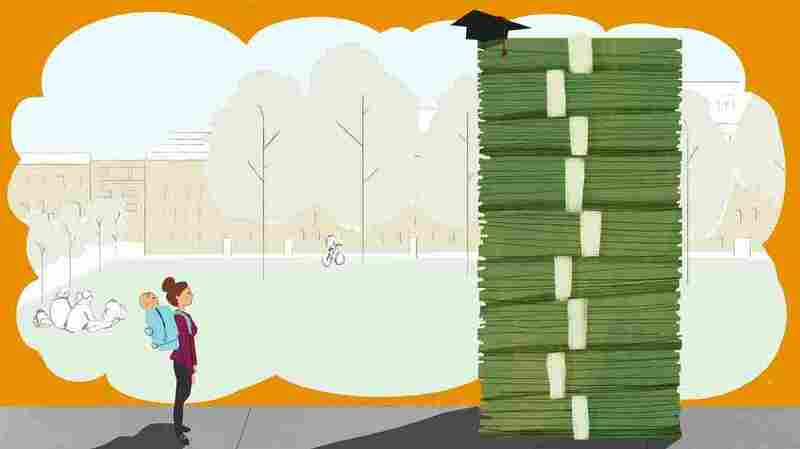 Add that on to the ever-rising cost of college tuition — both private and public — and the financial strain of getting a college education becomes a huge burden for low-income parents. So much so that only a third of student parents get a degree within six years, often citing mounting debt as a reason for dropping out. "What it comes down to is that college becomes a bit of an impossibility for a low-income parent who needs child care to go to school," says Barbara Gault, vice president and executive director of the Institute for Women's Policy Research, an organization that's done a lot of research on student parents. The primary source of federal aid for child care nationwide comes from something called the Child Care and Development Block Grant (CCDBG) — specifically for low-income parents and families. A block grant means that every state can develop its own eligibility requirements, which means it's tricky to know if you qualify. States have unique education-specific rules attached to the CCDBG — basically a bunch of extra hurdles student parents have to clear. Gault, along with a team of other researchers at IWPR, recently compiled requirements from all the states to get a snapshot of what student parents are up against. You have to work for the money. Twelve states require student parents to work in order to be eligible for the grant — and in Washington state, Kentucky and Arizona, they have to work at least 20 hours per week. That's a part-time job and college and the responsibilities of parenting. You can't aim too high. In 10 states, student parents may only be pursuing below a bachelor's degree. Of those 10, eight allow for only a vocational degree, and four have a time limit on education of two years or less. So in Rhode Island, for example, student parents are only eligible for the CCDBG if they are completing a training program that is less than a year long. You have to do well. Six states require "satisfactory" academic progress to remain eligible, although that isn't clearly defined. You have to stay busy. Over a third of all states mandate a certain amount of credits or hours per semester. For example, Mississippi insists that a student parent be enrolled full time in order to receive financial help with child care. Gault says these restrictions are tough, but points out that even if they were revamped and a student parent could easily qualify, the demand for CCDBG money is really high. Student parents must spend time on waiting lists that can take months, even years. "We need bigger solutions to these problems," says Gault. "These rules and restrictions in a way just exemplify how little we're thinking about the educational needs of parents." The landscape isn't completely bleak for student parents. A few states have their own funding set aside specifically for low-income student parents — Minnesota has had a grant available for almost 30 years. A handful of colleges offer free child care. And if President-elect Donald Trump follows through on his daughter Ivanka's call for child care reform, that could help out student parents, too. But while grant and subsidy money can be helpful, it's usually just a drop in the bucket. Even for student parents who are able to get federal funding for child care, most are still paying thousands of dollars out of pocket, Gault says. And where do college students usually get pocket money?